Finally, an alternative to cookie-cutter education: the personalized curriculum. 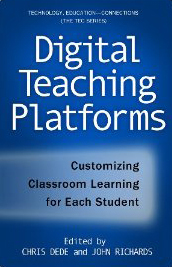 That’s the promise of Digital Teaching Platforms: Customizing Classroom Learning for Each Student, a book by Harvard educational technology researchers Chris Dede and John Richards, who say they have identified a new learning technology called digital teaching platforms (DTPs). DTPs represent the culmination of several evolving technology trends in K-20 education: the print-to-digital transition, the push for one-to-one computing, and the embrace of interactive display technologies. “For decades, researchers have been developing technology solutions to support learning, monitor student progress, foster classroom discussion, and provide a framework for teachers, but it’s been a challenge to create the efficient, one-step approach schools need,” says Dede, Wirth Professor in Learning Technologies at the Harvard Graduate School of Education. A core of the technologyFor example, with “Time To Know,” which provides a one-step solution for today’s one-to-one computing classrooms, teachers use an interactive comprehensive curriculum and a digital teaching platform to manage all classroom activities and deliver a personalized curriculum to every student. But will it blend with the Khan Academy approach?